Back by popular demand! 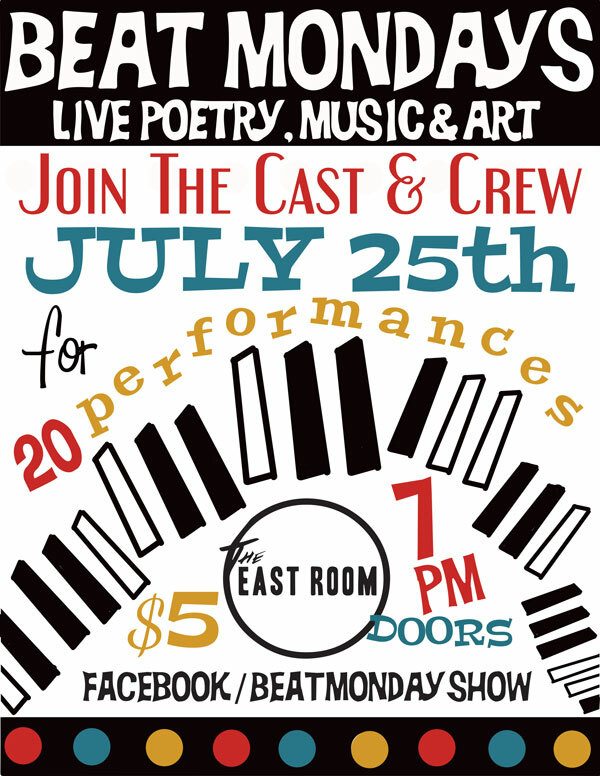 “Beat Mondays” is a live original poetry music show ran by artists for artists. It’s the first live variety show series of its kind in East Nashville. Hosted by a colorful cast of characters, charismatic poets, spoken word artists, singer songwriters, musicians and friends all across the east side. A true indie show created for purely the love & support for local artists in a DIY approach. You’ll also hear featured authors and bands on tour, purchase local art, books, and music directly from the artists themselves.. Experimental photographer & video artists capture the live magic, and love to shoot the most eclectic east-side show ever put together. You can now get your own super- affordable photography and/or video projects for all artists & musicians. Many resident writers return each month and make many life-long friends and connections. Most folks agree that this is a very unique, one-of-a-kind live experience by dozens of talented people from all walks of life. Come out and show your support!